Big technical changes announced little over a year ago for the IZOD INDYCAR Series is quickly coming to reality. An all-new race car will be christened with the season opening race connecting the series to the advanced technologies utilized in the modern automobile industry. Among many changes upcoming to the 2012 IZOD INDYCAR season is completely revised engine specifications. Regulated to twin-turbocharged 2.2 liter V-6 powerplant, the series entrants will be presented with a choice of manufacturers for the for time since the sanctioning body's 2005 open wheel racing season. As the current 2011 season has just past its halfway point, several major INDYCAR Series teams have already decided on the powerplant choices for 2012. 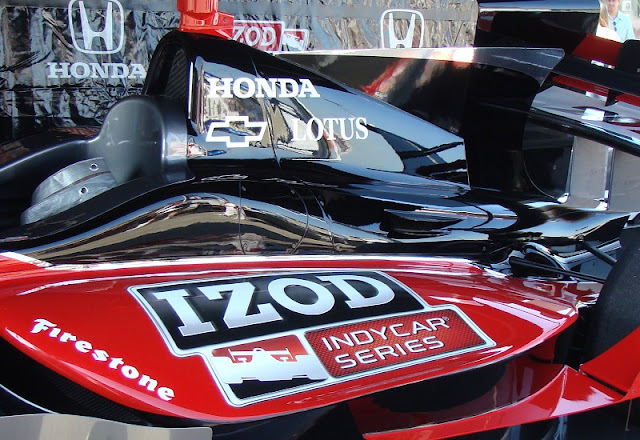 After powering the IZOD INDYCAR Series through the past 6 years as the sole engine supplier, Honda will remain one of three manufacturers which now sees direct competition from Chevrolet and Lotus. The first race team to announce their 2012 powerplant choice was Penske Racing. Prior to the new year, Ilmor Engineering confirmed involvement with the Chevrolet brand's return to open wheel. A long-time partner with Ilmor, team owner Roger Penske was present at the introduction ceremony. Absent from open wheel racing since the end of 1993, Chevrolet's history with Penske Racing included three Indianapolis 500 victories and a 1988 championship on the CART World Series. Penske Racing intention to run Chrevrolet engines in 2012 was followed almost six months later by powerplant confirmation from rival Chip Ganassi Racing. For the 2012 IZOD INDYCAR season, the Target/Chip Ganassi Racing and rookie Chip Ganassi Racing team has elected to remain faithful to Honda power. 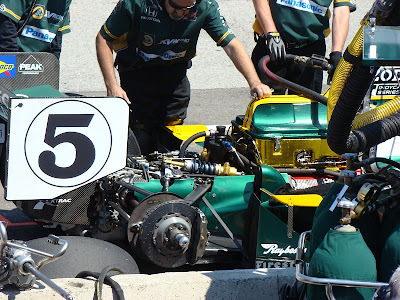 Winning the past three IZOD INDYCAR driver titles titles with Honda engines, Target/Chip Ganassi Racing became a powerhouse combination on the CART World Championship during the late 1990s. On July 19th, long-time series team AJ Foyt Racing confirmed their #14 car will remain powered by Honda Racing Development through the 2012 IZOD INDYCAR Series season. In response to the race team making an agreement with the Japanese-born auto company, president of Honda Performance Development and vice president, corporate planning and logistics, for American Honda Erik Berkman responded, "A.J. shares many traits with Soichiro Honda, the founder of our company. Passionate, dedicated men, their names became synonymous with racing in their native lands, and each has served as a symbol of his country’s passion for motorsport around the world. Today, we consider A.J. to be a venerable member of the Honda ‘family,’ and we look forward to our continued association with both the man and his team." On the side of AJ Foyt Racing, the four-time Indy 500 driver turned team owner AJ Foyt stated "I am really looking forward to working with Honda next year,". There has yet to be a confirmation for teams opting for the Lotus engine. Expect KV Racing Technology, a current technical partner with Lotus Motorsports, to officially declare the usage of the British sports car company's engine. Perhaps one of the last remaining superteams still in play for their 2012 engine decision is Andretti Autosport and Newman/Haas Racing. Yet to confirm their choice, Andretti Autosport is equally as likely remain with Honda as it is with taking a chance with Lotus or Chevrolet. Building a close-knit reputation with Honda, the Andretti family also has a history connected to each of the other auto manufacturers competing on the 2012 IZOD INDYCAR circuit. Michael Andretti won the 1991 INDYCAR/CART World Championship with Chevrolet power while Mario Andretti became the 1978 Formula 1 World Championship driving for Colin Chapman's Team Lotus. A wild card decision for 2012, expect Andretti Autosport to choose what is best for both sponsors and for the team's competitiveness in the future IZOD INDYCAR Series. In the case of Newman/Haas Racing, staying with Honda could be a likely decision but other engine suppliers are not completely out of the equation. With Honda power in the IZOD INDYCAR season, Newman/Haas Racing has two team victories in 2008 but has not won a race for almost 3 years. Newman/Haas could select Chevy power for the 2012 season marking a return to a powerplant the team used from 1987 to 1991. With a chance to completely shake up the front-runners to the 2012 IZOD INDYCAR Series, engine manufacturers choices could affect the balance of competition for the anticipated new car season.